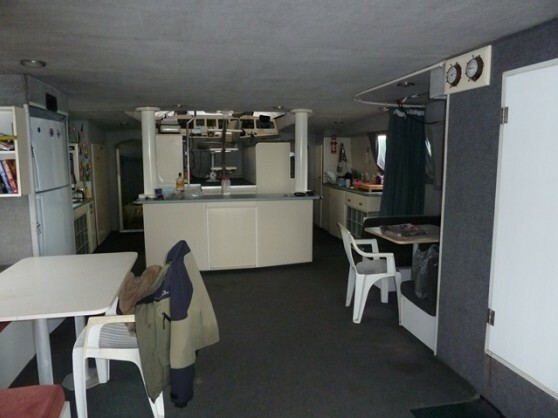 Fully guided 6 day (5 night) liveaboard charters are operated on a regular basis departing Fridays and returning Wednesdays from early April to early December. 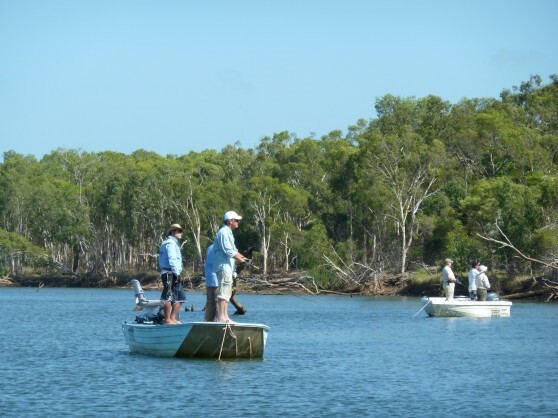 Aurukun is located on the junction of 3 pristine rivers, making it an ideal location for unique fishing adventures. The Archer, the Ward and the Watson Rivers are on the doorstep, as are the beaches and reefs outside the mouth of the system. Just to the south are the Kirk and the Love Rivers each offering unique fishing options. These can now be accessed from the comfort of the Mothership 'Manta Ray'. 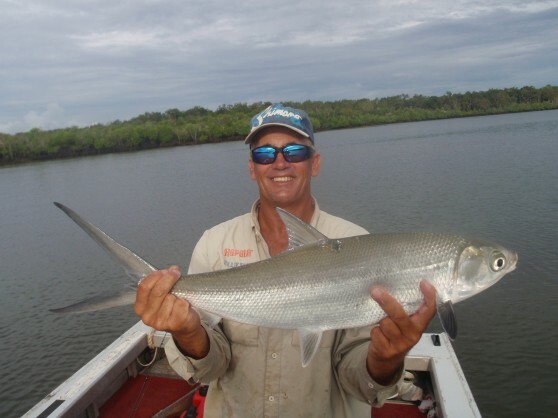 Aurukun Fishing Charters has created a superb fishing tour that cruises a pristine tropical wetland river system which is virtually un-fished. Aurukun is located on the junction of three pristine river systems making it an ideal location for unique fishing adventures. 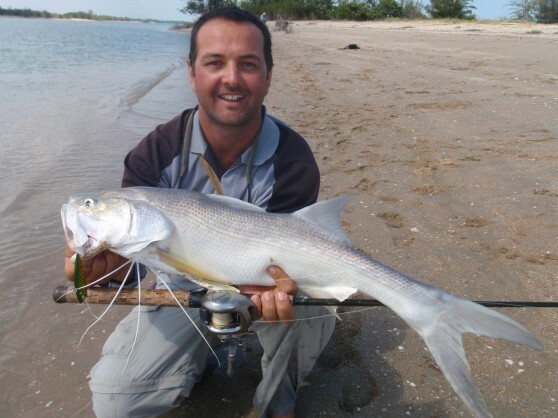 Anglers can target reef, blue water, river and estuary and freshwater / lagoon species, as desired. Tidal estuaries, white sandy beaches, near-shore reefs, rocky headlands and even fresh water rainforest reaches are accessible on good tides. This variety and diversity will be sure to have your head in a spin - with quality angling on offer for the lure or fly caster. 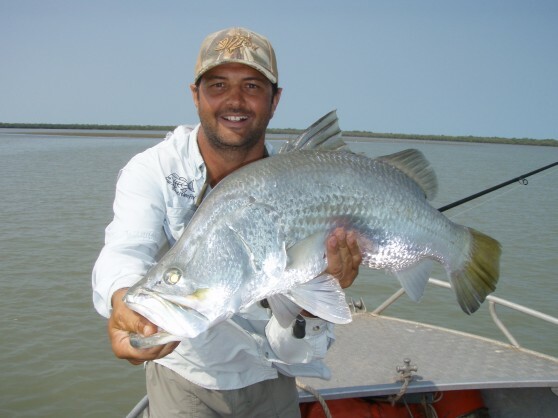 The remote waters south of Pera Head on the west coast of Cape York have previously been the domain of truly adventurous anglers. A thousand lifetimes worth of reefs, rivers, creeks, flats and lagoons are just waiting for the uninitiated and round here, the fish grow big! Target species include, huge Barramundi, massive Milkfish, Mangrove Jack, Soty Grunter, Mackerel, Giant Herring, Tuna, Giant Trevally, Golden Trevally, Permit. The shallow reef and rock patches provide fishing for Fingermark, Coral Trout, Red Emperor, Nannygai, Stripies, Bluebone, Mangrove Jack and many more. The operation is closely linked to the local community of Aurukun. This allows access to an extraordinary range of angling opportunities and most importantly, gives fisherman the advantage of stepping off the boat, something not allowed to many other fisherman visiting this area. The Manta Ray has direct access to four diverse waterways. The Ward, Watson, Small Archer and main Archer Rivers. Each of these systems having a myriad of smaller creeks which flow into them. 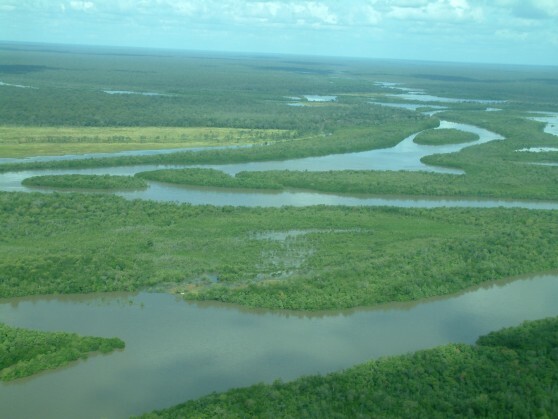 There is a massive wetland area south of Aurukun, based around the Archer, Love, Kirk and Kendell Rivers. This area is of huge ecological significance and is the reason why wildlife is so abundant. 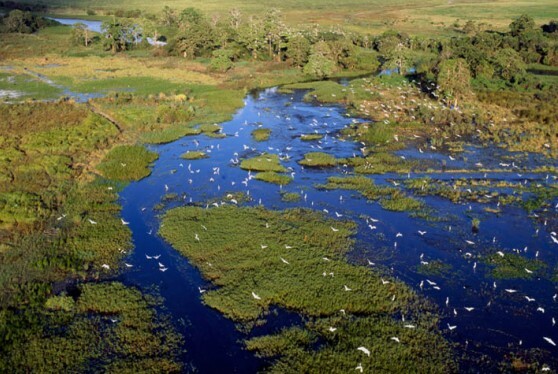 The floodplains, lagoons and salt-pan areas dotting the upper reaches of these creeks and rivers provide a nursery for Saratoga, Sootie Grunter, Mangrove Jack, Tarpon and of course, the mighty Barra. 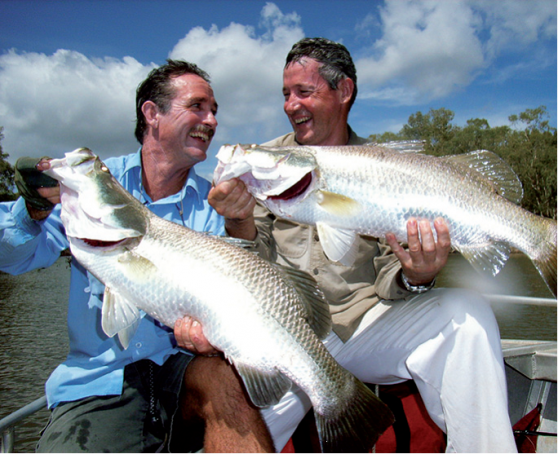 There has been plenty of press given to the quality Barramundi fishing in this area. 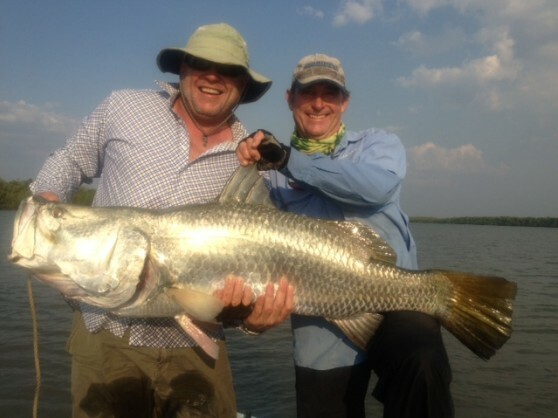 Cricket score catches of Barra can be had after the wet-season and again in Oct-Nov. 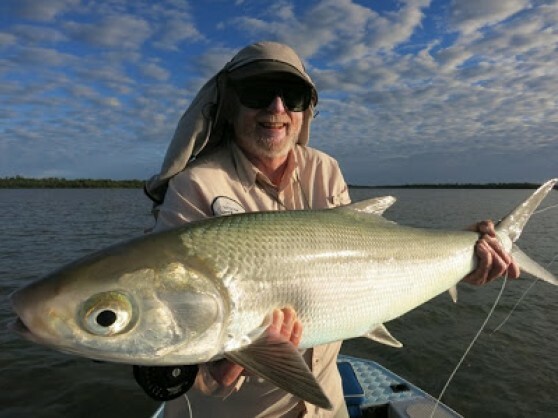 There is also amazing diversity of Barra fishing, giving anglers the choice of targeting big, fat, up-stream Barra or their startling-silver, yellow tailed cousins in the downstream reaches. Angling options around here go well beyond Barra, with a range of the north's premier sportfish on the list. 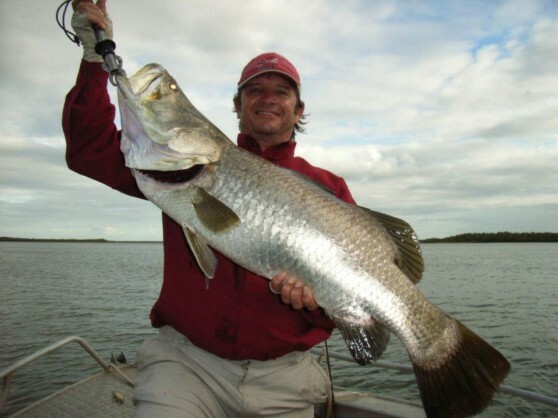 All types of fish can be caught on a range of tackle using an equally large range of techniques. Most anything that resembles a popper, or will skitter across the surface, will do for queenfish. Amongst flies, Lefty's Deceivers, Clousers, Pink Things, Bendbacks and Dahlberg Divers and their hybrids are attractive to Queenfish and other tropical fishes. 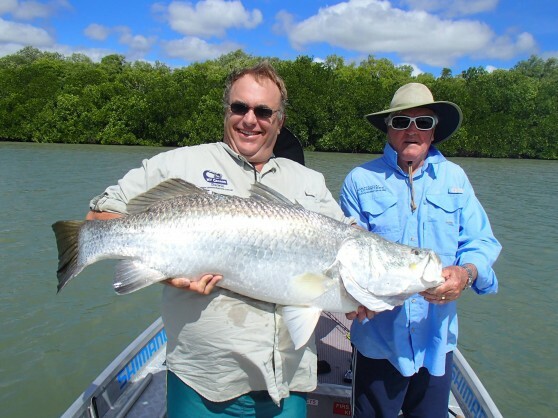 The run-off of the floodwaters produces some extraordinary, unmatched lure and fly-fishing moments for Barramundi, Mangrove Jacks and Sooty Grunter in the upper systems, whilst 'Queenfish Flats' literally boils. 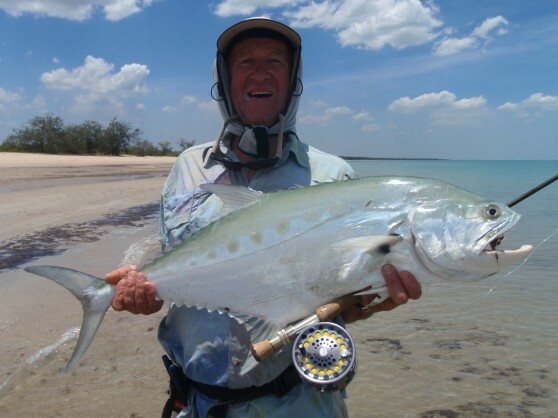 A well-presented lure or fly will entice Mangrove Jacks, Fingermark, Trevally, Queenfish, Salmon (king & blue) and Cod from the snags and Trevally, Queenfish, Mackerel and Tuna off shore. While the run-off fishing is first-rate, other options remain varied throughout the year. You will be staggered to see the clarity of water with neap tides in the middle of the year. A small Mackerel caught 15km up the river on a soft plastic lure didn't even come as a shock! Fishing pressure is minimal in these parts and everything from popper gulping Sooty Grunter to plastic smashing Fingermark are an option on any given day. A large system of reefs in close proximity to the coast, combined with rocky headland and long sand flats opens up an amazing array of light tackle sport fishing. 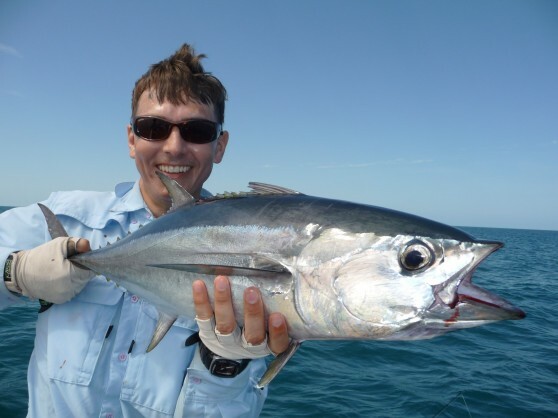 Queenfish, Mackerel, Giant Herring, Tuna and Trevally can be seen cutting tight balls of baitfish to shreds, while Golden Trevally and Permit cruise around in relatively shallow water. 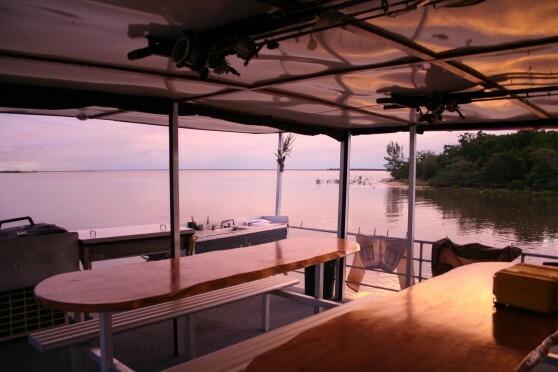 The boat is crewed by well-experienced and friendly guides who have an invaluable depth of knowledge in this region. The Master of the Vessel has had over 20 years local experience, having run a Barra and mud crabbing operation previously. Our dedicated fishing guides will provide anglers (both experienced and non) with valuable knowledge of the local fishing environment. They will ensure that you enjoy a safe and memorable holiday, always on hand to make your stay with us comfortable and relaxing. We work hard to give anglers the type of fishing experience they are looking for and provide the kind of diversity in species and location unparalleled by most operations. Options are always weather and tide dependent. 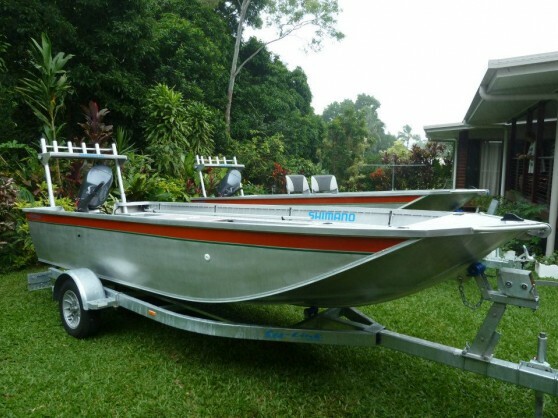 But on any given day, no matter what the weather or tide, there will be angling options. 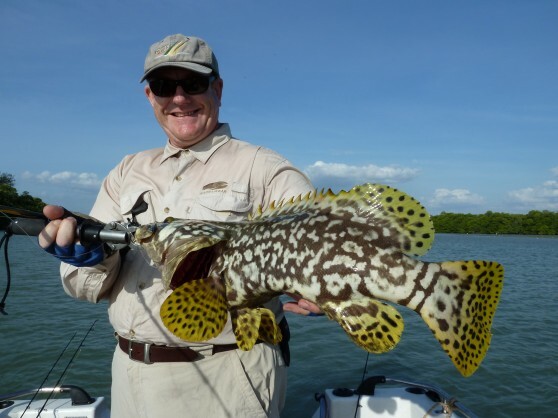 Trips can be tailored to your fishing desires and all fishing types (lure, live/dead baiting and fly) are available. 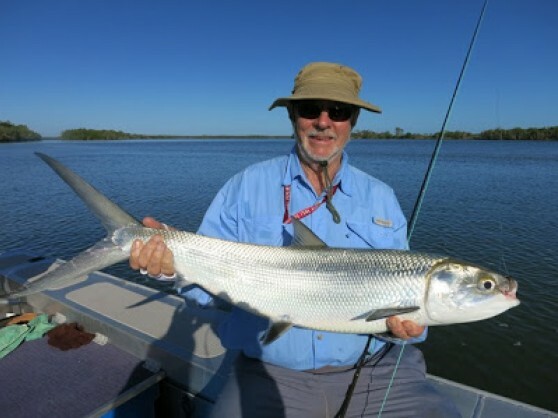 The charter rate does not include the cost of flights between Aurukun and Cairns with Skytrans - currently offered to Aurukun Fishing Charters customers at the special rate of $750 per person return. A minimum booking of 4 anglers applies. A maximum of 6 anglers applies. 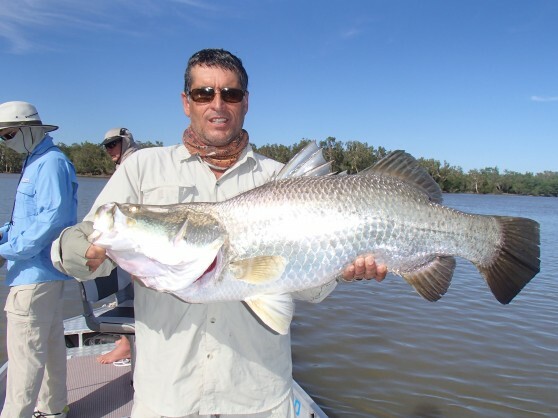 If the tides or weather are not conducive to fishing, extra activities will be offered to clients (at no extra cost) such as waterhole swims, bush tucker walks, croc spotting and traditional spear throwing demonstrations. 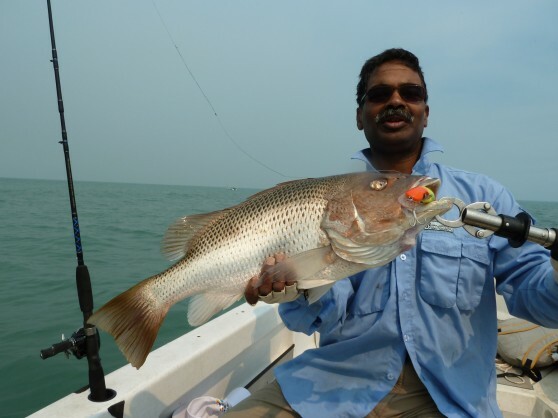 Rods: A 6-8kg fishing rod no larger than 6 feet for estuary fishing is ideal. On board we use the strong and reliable Silstar Power tip 6-10kg sticks, which suit most situations. For anglers who wish to bring a spin-stick for light game purposes (chucking slugs, poppers, trolling lures), something in 8-10kg range would be ideal. 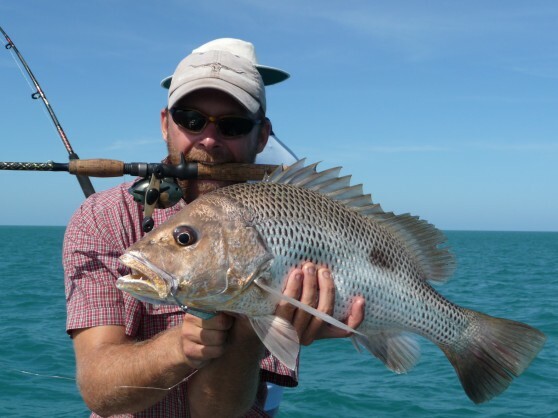 For fishing the reef and off shore grounds a 12 -15kg rod of around 185cm is adequate (we have larger rods available, so don't bother with anything heavier). Reels: Good quality overhead (baitcaster) or thread line (egg beater) fishing reels are advisable. Ensure your reel has a good quality drag system and have it spooled with 8-10kg mono, or 30lb braid (guide only). 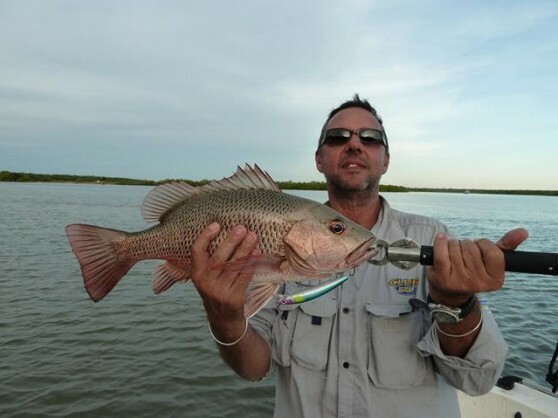 In terms of larger spin reels, have them spooled with 10-12kg mono or 30-60lb braid. Larger overheads in the 12-15kg range are advisable (we use Abu 7000 with 15kg mono) and you may want to bring a larger reel (e.g. Charter Special / TLD20) to match with our larger rods. Traces: Bring yourself a small reel of 40-60lb monofilament trace material. Maybe some heavier trace and 1x20m of 60-80lb wire trace material (Twist weld or crimp type). Opinions about the use of soft plastic lures abound. Anglers who are interested in using soft plastics are encouraged to do so, however the boat does not supply a large range. It is a matter of personal choice! Instead of bringing bulky tackle boxes, try to keep lures in portable water-resistant flat plastic boxes. Fly fishing is a highly specialized sport. This is not the place to begin fly fishing for the first time! Having said this, there will be a guide who can help anglers beginning on the long road to mastering the fly rod and reel. Anglers wishing to fly fish are encouraged to bring their own gear (plus flies) and ensure rods are either three or four piece. It is inadvisable to bring anything lighter than a #9 weight rod and we usually use intermediate sink lines or floating lines with a sink tip. 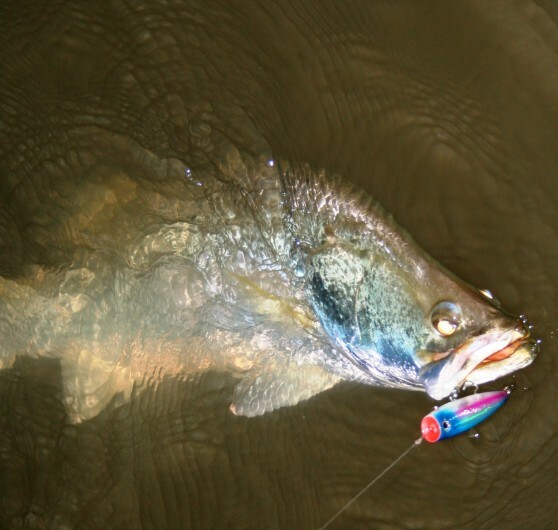 Anything that resembles a popper, or that skitters across the surface, will do for Queenfish. Amongst flies, Lefty's Deceivers, Clousers, Pink Things, Bendbacks and Dahlberg Divers and their hybrids are attractive to Queenfish and other tropical fishes. A range of Deceivers and Clouser Minnows, and a small variety of other patterns, should suffice. Remember, if you are on a charter with other fisherman, the fly fishing option will be dictated by space, weather conditions and fish availability. 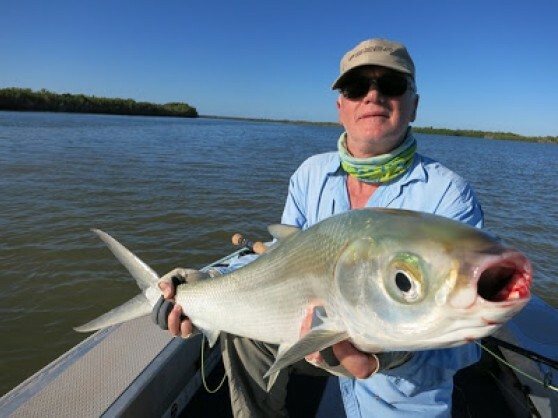 Charters dedicated to fly-fishing can be arranged, however for space and comfort whilst fishing, group size per tender must be taken into account. 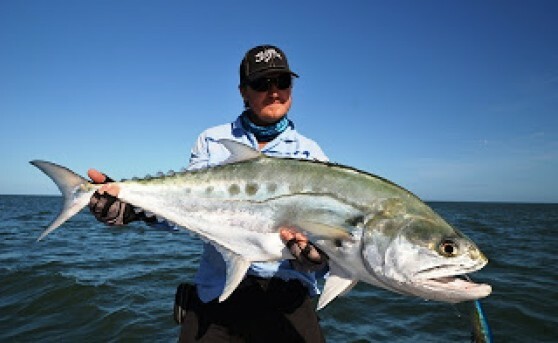 Should anglers arriving in Cairns require personal assistance in choosing their tackle, Keith Graham of Bransfords Tackle Shop has kindly offered to pick up clients from their Cairns hotel / accommodation (with sufficient notice) and drive them to his outlet to select the right gear for the conditions. Don't forget to bring your hat (one which stays on whilst boating! ), sunglasses (polarized best), sandshoes / walking sandals, plus sun screen and insect repellent. Cameras are a matter of personal choice. Photos can be burnt onto either CD or DVD and played back right there on our large flat-screen TV. A 16 kg per person baggage weight restriction applies for light aircraft flights. Rod tubes must not be over 2m in length and should not be bulky. 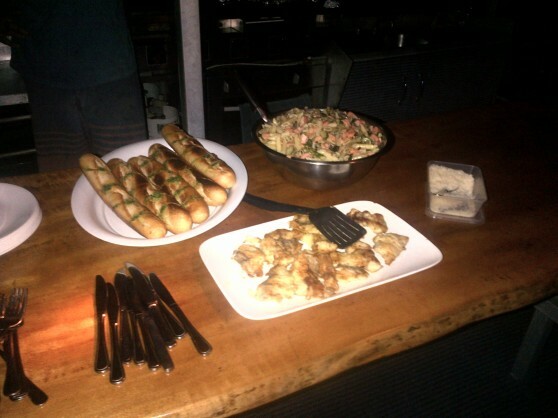 Part of any experience to this area is the food. Our experienced cook will work hard to give clients memorable meals. Supplies come via a barge from Cairns and fresh produce (including special need items) can be flown in weekdays with the regular Skytrans service. 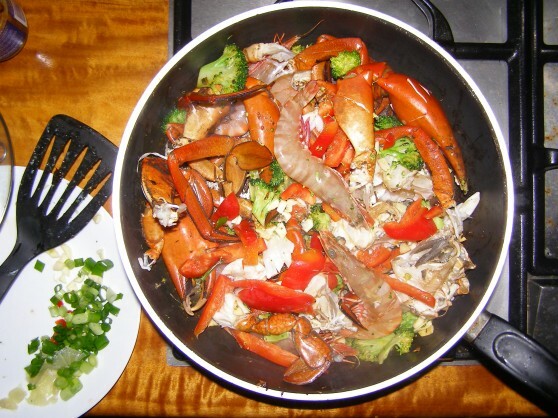 A selection of fish will form a large part of the diet onboard and delicious mud-crabs are a proposition for anglers who savour these delicious crustaceans. Any special dietary requirements should be indicated early to provide adequate time to get items in stock. Alcohol in moderation can be provided but NOT included in the charge. Aurukun, and the surrounding land and water-ways, are alcohol restricted areas. Customers are advised NOT TO CARRY ALCOHOL into Aurukun with them as significant penalties apply. For more information, please visit www.alcoholimits.qld.gov.au. 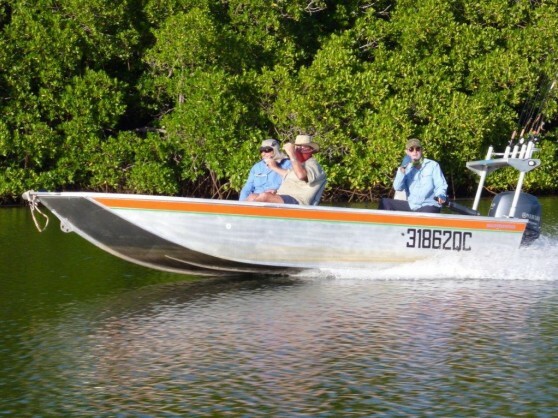 The liquor license for Aurukun Fishing Charters only operates between 5pm and 10 pm and is restricted to mid-strength beer and "wine-with-meal" only. If you have a specific request for beer or wine please let us know early (at least 4 weeks prior to departure). A selection of quality red and white wines is available. All rates quoted are in Australian Dollars, are GST inclusive, and valid to 31 December 2013. The charter is "land content" only and does not include the cost of transport to and from Aurukun at the commencement and completion of the charter. Minimum (4) and maximum (6) passenger numbers apply. A deposit of 30% of the total charter cost is required at the time of booking to confirm your booking. The balance of your charter (plus return airfares) is payable 4 weeks prior to departure date. At that time we will finalise your booking and also request payment for any alcoholic beverages to be purchased on your behalf. Cancellation 30 days or more prior to departure date, a full refund less a $35.00 per person administration fee will be made. 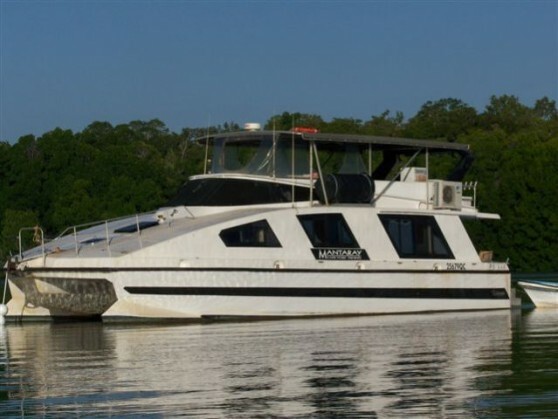 Cancellation less then 15 days prior to charter, no refund will be payable to the client. In the event of the scheduled charter not operating due to extreme weather, all monies will be refunded. Charter itinerary may vary depending on prevailing weather and tidal conditions and is advised as a guide only. This is a sport fishery "second to none" and to ensure it remains so, for the benefit of many and for years to come "catch and release" practices are encouraged.